While the 2015 McFarlane NFL 36 Sports Picks lineup has a couple of player debuts, it focuses primarily on new figures of bigger stars. In a bit of good timing, it also has a big-name player wearing some new threads following the early free agency blitz. Headlining the list of returning stars is Andrew Luck of the Indianapolis Colts. Despite it being early in his career, this is his third McFarlane. Rather than an in-action pose, he's shown kneeling with his helmet off. DeMarco Murray was originally going to be included as a member of the Dallas Cowboys. 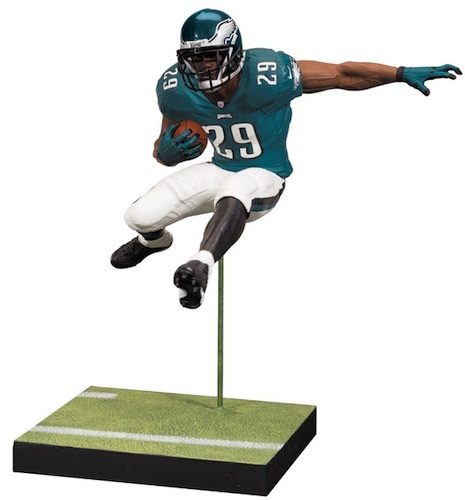 However, now that he's signed with Philadelphia, the running back gets his first figure with the Eagles. 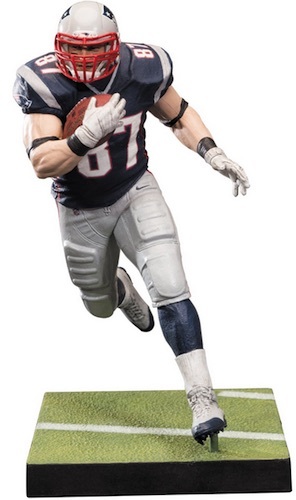 After debuting in NFL 33, J.J. Watt, the NFL's 2014 Defensive Player of the Year, gets his second figure. Rob Gronkowski rounds out the players with previous figures. 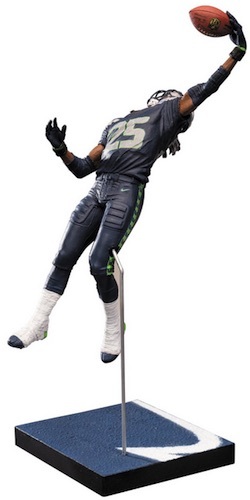 2015 McFarlane NFL 36 has a pair of debuts, Richard Sherman of the Seattle Seahawks and Cincinnati's Giovani Bernard. All six figures have variants. These limited edition figures come with different uniforms. 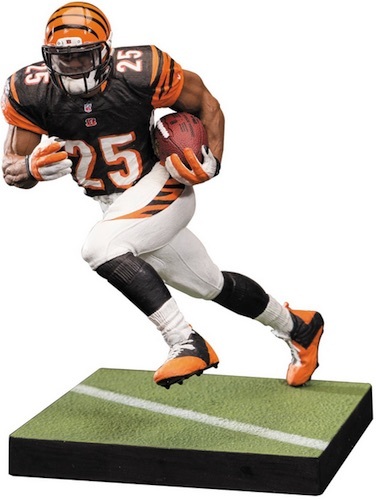 The Giovani Bernard is the rarest with no more than 100 copies. 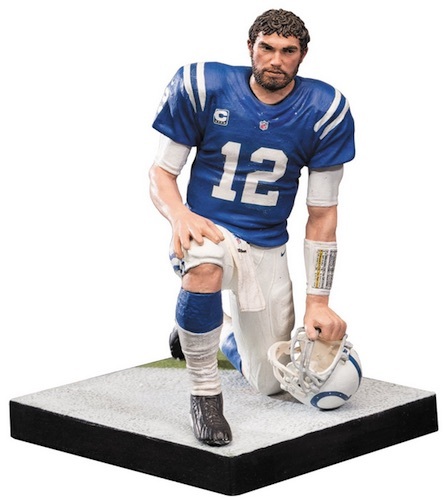 McFarlane NFL Series 36 Indianapolis Colts Andrew Luck Blue Jersey. Andrew Luck Chase McFarlane NFL Series 36 Indy Colts CL #0333 1000 MIP VHTF! Richard Sherman Chase McFarlane NFL Series 36 Seahawks #1253 3000 MIP VHTF! Richard Sherman Chase McFarlane NFL Series 36 Seahawks #1564 3000 MIP VHTF! 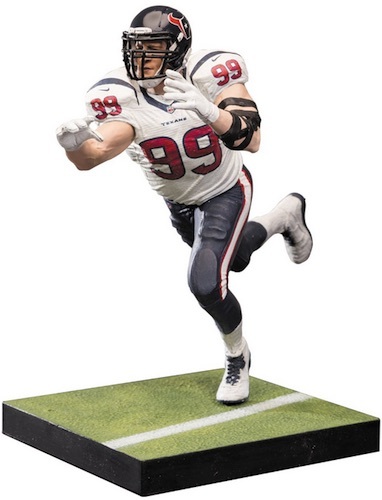 JJ J.J. Watt Chase McFarlane NFL Series 36 Houston Texans #0901 1000 MIP VHTF! Click on listings or images to shop for figures on Amazon. Print runs listed below, when available. Click on listings or images to shop for figures on eBay. Just when you think you’ll never find another decent figure at retail – scored 35/100 Bernard today at my local mall. Not worth what it used to be but I’ll take it!! !